FREE Valentine's Spelling Test Printables! Super CUTE! FREE Valentine’s Spelling Test Printables! I’m not sure about your kiddos, but mine love to display their Spelling Tests on the refrigerator. So I decided to make these festive Valentine’s Spelling Test Printables for my children. I thought they were cute, so I wanted to share them with you. There are (4) different pages to choose from depending on what spelling level your child falls into. The more advanced pages have space for dictation. You can use these Valentine’s Spelling Printables with any spelling program. These printables are FREE for my newsletter subscribers. When you subscribe, you will receive the link instantly via email. Please be sure you check your spam folder. I create new freebies weekly, so you will always have something to look forward to. 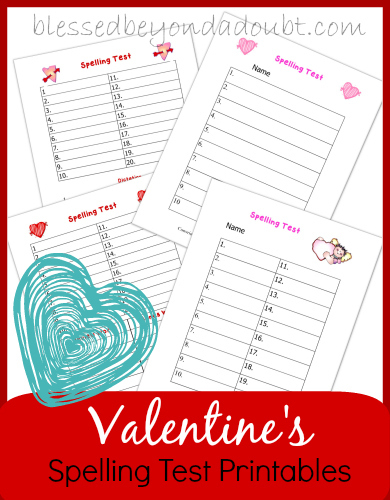 Thanks for sharing these Valentine Spelling Test Printables with your friends.